Who were the winners at Fight Night: Poirier vs Gaethje? Click below to get the results for all the fights at Gila River Arena in Glendale, AZ on Saturday, April 14, 2018. Two veterans with a reputation for leaving it all in the Octagon came out giving fans the energy the fight deserved. Condit came close three separate times at executing a choke late in the first round until Oliveira was literally saved by the bell. Cowboy dominated from the ground for much of the second, however, despite some excellent up-kicks from Condit. Oliveira’s pressure kept his opponent on his heels enough to ultimately execute a guillotine choke and got Condit to tap. Official Result: Alex Oliveira def. Carlos Condit by submission (guillotine) at 3:17 of Round 2. Two fighters happy to stand and trade did precisely that. The fight never went to the ground, and while Rainey impressed in his UFC debut with some heavy strikes and forward pressure, a clean right from Salikhov dropped him and left him vulnerable to the hammer fists that followed. Salikhov gets his first UFC win with the KO. Seeming determined to win one in front of his receptive Arizona hometown crowd, Morgaga displayed an excellent boxing game plan and owned the fight when it stayed standing. Predictably, the veteran Reis was able to swing the momentum back to his side when the fight went to the mat and his patented wrestling skills took over. But Moraga’s effort was relentless, and despite possibly dropping the third round, his scrappy resolve was good enough for the unanimous decision (29-28) and his third win in a row. It marks the third consecutive loss for Reis. 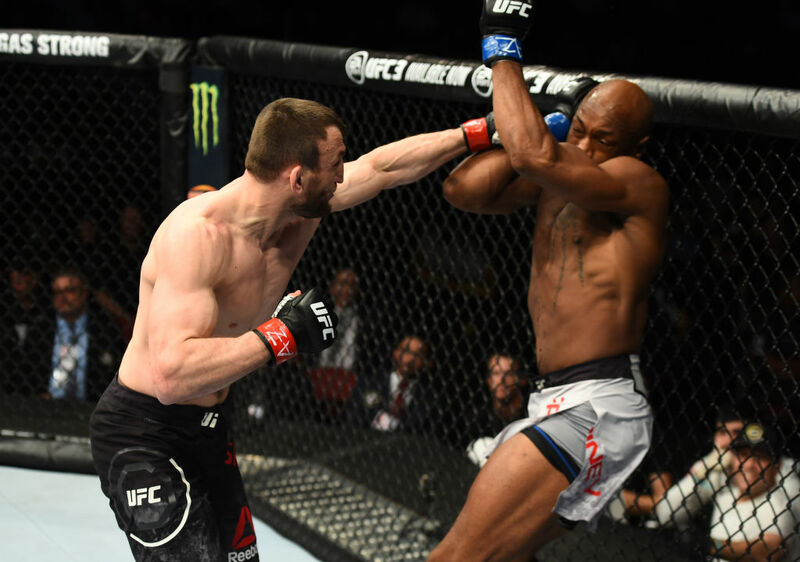 The battle of two hard-hitting middleweights featured plenty of damage on both sides, but Jotko’s tendency to leave himself open was exploited by Tavares one too may times, ending his night with a barrage of hammer fists in a third round TKO. It was Tavares’ fourth win in a row, and he called out Michael Bisping from the Octagon. 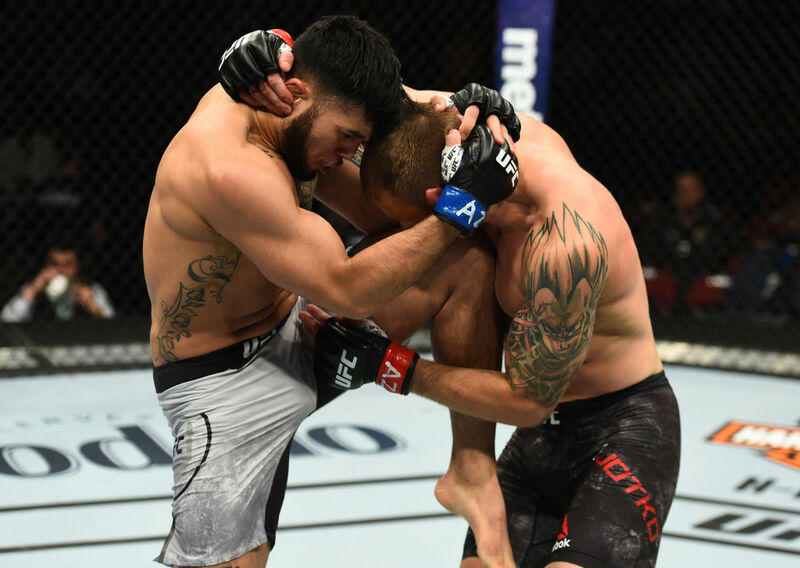 Despite being a short notice replacement AND making his UFC debut against a hard-hitting fighter like Gilbert Burns, Dan Moret looked like a dangerous veteran in the mostly-standup first round. In the second round, however, Burns’ notorious power took its toll and a fierce combination ended Moret’s night early. Burns gets the KO at :59 in the second. Two fighters looking to stake their claim in the new women’s flyweight division, Shana Dobson and Lauren Mueller didn’t seem to have any jitters under the spotlight. Dobson regularly found a home for her right hook and Mueller showed off some solid striking combinations and footwork. Trading leather from the opening bell to the last in a thoroughly entertaining fight, it was Mueller’s edge in the control game was good for the unanimous decision (29-28 ) in her UFC debut. In his first fight inside the Octagon at 170 pounds, Yushin Okami dominated the action against Dhiego Lima. 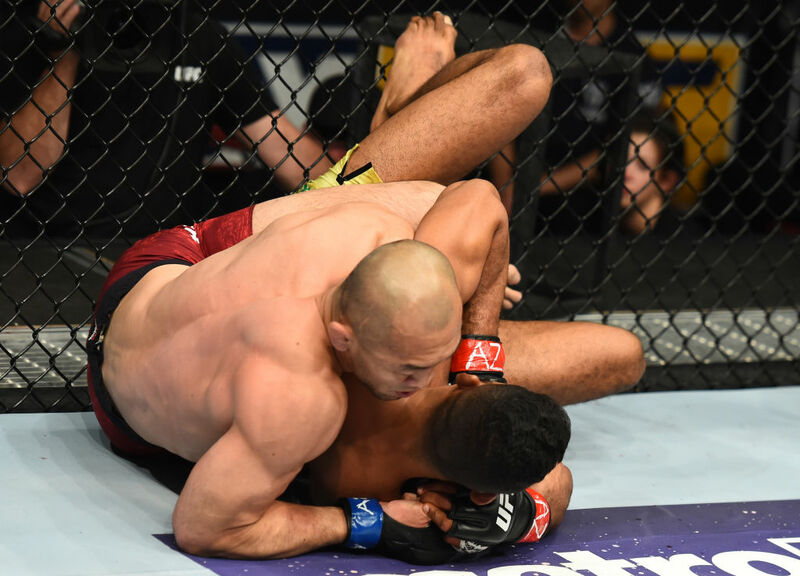 Okami landed 5 of 10 takedowns and controlled Lima on the mat for 12:35 of the 15-minute bout to capture his first win in the UFC since March 2013. In his sophomore UFC outing, Bhullar was able to put his Olympic wrestling prowess on display early against Wieczorek, dropping him to the mat and working from the top with a series of elbows and strikes for the majority of the round until the ref stood them up with half a minute remaining. On the feet, the advantage was clearly to Poland’s rangier Wieczorek, who was able to land some overhand jabs early in the second until a right hook form Bhullar rocked him enough to return the mat for more wrestling. But Wieczorek wielded his own surprises from the canvas and using his powerful legs executed only the second omoplata submission in UFC history. Another bantamweight brawl featuring two sneaky-good talents aspiring to break the division open, Matthew Lopez and Alejandro Perez came out looking for the finish. Lopez nearly had the submission on an early takedown until Perez patiently worked out of the RNC. Perez got off plenty of strikes, but on the ground the game belonged to Lopez in the first. The fight never went back to the mat in the second, and that was bad news for Lopez and Perez was able to capitalize on his striking advantage, ultimately firing off a left and then a right that had the referee step between them and hand Perez the second round TKO. Perez in undefeated in his last six fights. "That "Cool Hand" is that left hand of Luke Sanders." A tough-to-pick bantamweight match kicked off the Arizona event with both fighters getting some good work in during the first round, particularly Sanders who bloodied the head of Williams when he dropped him with a right-left combo. Williams looked rejuvenated in the second and found plenty of purchase for his right uppercut, although Sanders still got in plenty of heavy kicks including a loud shot to the head, and his left hand continued to open Williams’ wound. An even round three finished out the fight with both men continuing to be aggressive until the bell, and Sanders’ continuous forward pressure doing enough to get the unanimous decision (30-27, 30-27, 29-28).